"There is now a move in business towards using data more intelligently and I have personally embraced it completely, thanks to MarketingSherpa’s generous share of exclusive case studies, surveys, and results data analysis (freely available, if I might add)." 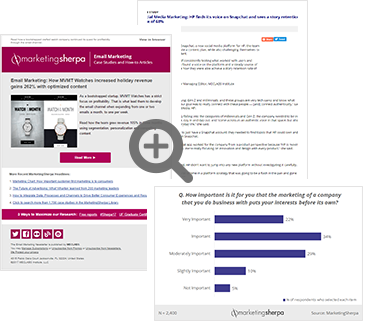 See examples of the inspirational case studies and useful tools you’ll receive as part of the MarketingSherpa community. MarketingSherpa is a research institute specializing in tracking what works in all aspects of marketing. Since 2000, we’ve published more than 1,500 case studies with diverse brands from global e-commerce brands like Sony Electronics, non-profit organizations like charity: water, to small brick-and-mortars like Value City Furniture. By subscribing, get the latest case studies and data on topics like email, inbound, lead generation, and ecommerce marketing along with MarketingSherpa updates and promotions. Enter your email below to receive MarketingSherpa news, updates and special offers on our events and products.